Luxury is above all simplicity”, emphasized Christian Dior with his creation of the historic Bar suit, the Lady Dior bag and the cult fragrance J’adore Dior. The limited edition Dior VIII with ceramic and metallic coloured strap, imbibes the heritage of the couture house and is every bit feminine and flawless. Dior VIII pays tribute to the couturier’s spirit of cultivating trends. The name, also consisting of eight characters, is reminiscent of the founder’s lucky number – the date his label was created – October 8, 1946 and the name of his first collection baptised ‘En Huit’. The watch features the roman numeral VIII indicated at 8 o’ clock on the dial. The 33mm version of the timepiece has a captivating insert, only black ceramic can achieve. Embellished with a turning bezel set, the meticulously placed black ceramic pyramids are emblematic of the house, and reveal their passion for structured lines. The dial portrays certain timelessness, and is fittingly compared to a little black dress – every woman’s wardrobe essential. Cutting through the dark colour, the seconds’ hand is a blooming orange, while the central ring is coated with a trickle of pink sapphires. 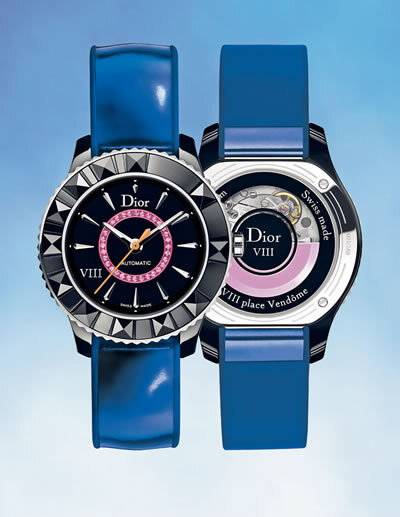 This year the Dior VIII is infused with shades of blue and pink. For the first time, this piece is proposed on blue and pink metallic-coloured leather straps with rubber lining in matching shades. The movement, whose oscillating weight is pink lacquered, features a 40-hour power reserve. A rare collectible – these opulent baubles are limited to just 188 pieces. Even though it breaks through the signature monotones, the ultra-thin case with its subtle attachments is spare and uncluttered. Developed in the ateliers of Dior Horlogerie at La Chaux-de-Fonds in Switzerland, it breathes precision and refinement. Quintessentially feminine and innovative, the Dior VIII opens a new chapter in the collection. In a mix of materials, finishes and colours, its elegant design is perfectly in keeping with the fashionable spirit. Indeed, this timekeeper is destined to transcend fashions, and is like the wardrobe of the couture house – ahead of its time.